The application deadline for Mount Carmel Health System colleagues is March 8. The MCCN Master of Science (MS) Program is designed for career-minded baccalaureate-prepared registered nurses who are ready to assume even greater responsibility and reap the benefits of expanded career opportunities. 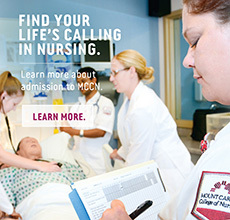 Mount Carmel College of Nursing is accredited by the Higher Learning Commission: North Central Association of Colleges and Schools. The Master’s program is authorized by the Ohio Board of Regents. The Master's Program has earned nursing accreditation with the Commission on Collegiate Nursing Education (CCNE) through December 31, 2022. Thinking about taking your graduate education to a higher level? Explore our Doctor of Nursing Practice (DNP).